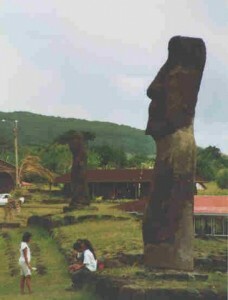 The only way to go to Easter Island is via LAN Chile from Santiago on the way to Tahiti. The island is so far from everywhere, so to put things in perspective, imagine mainland Chile to be in Israel with ocean existing between Israel and the US and a smattering of islands in the US (French Polynesia). Then the only island in between would be in London (Easter Island) with its nearest in New York (Pitcairn Island, as in “Mutiny on the Bounty”). Easter Island (Isla de Pasqua in Spanish or Rapa Nui in Polynesian) belongs to Chile. 2,000 people live on Hanga Roa, the only big settlement. Very few original people remain, having all been dragged into slavery in the late 19C to work on the guano mines in Peru. There are three discos on the island all starting after midnight, when people have finished watching TV. When I visited, the island was so isolated, TV was brought on videos by plane and is a complete morning-to-evening video recording of the main Chilean TV channel. It was then transmitted on the island, 3 days later. The islanders had not watched a live football match in their lives. Still, I had a whale of a time on Easter Island. I found a nice room with bath for $12 and made some good friends quickly. A Swiss nurse from Bern I became very close to, Beatrice. We hung around, drank and chatted with other backpackers. Everyone had come to Easter Island to see the moai, the giant heads erected for some unknown purpose. We now know how they were put up, though. The quarry was in the crater of Rano Raraku, where most of the pictures of moai you normally see are taken. They were most likely put on rolling logs and transported to their erection sites. This explains two other mysteries as well: the absence of trees on the island (they were all cut off for the moai – there is excavated pollen evidence of vegetation before man arrived) and the sudden stoppage of carvings and statue erections (the trees became depleted). 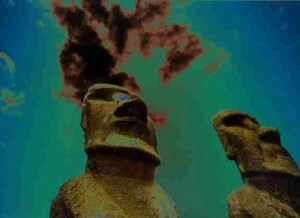 In that respect, Easter Island has become a model for an ecological catastrophe in a small scale. The first day I was there, I got so excited wanting to see some moai that I went off in the afternoon sun, and got burned in my nose, ears, neck, legs and backs of legs. I bought a bottle of Lidocaine ($10) and used most of it. I did not wear shorts again. 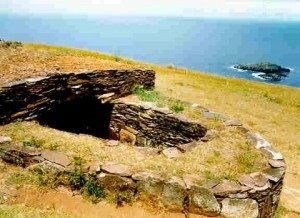 The 'chicken houses' of Orongo; the two small islands at the back were the destinations of the birdman ceremony. On Wednesday I climbed the Orongo crater to the ceremonial village of Orongo where the birdman ceremony was held. During this ceremony, representatives of all tribes would descend the steep rock cliffs and swim through shark-infested waters to obtain the first egg of the migratory sooty tern. To a people as isolated as the Easter Islanders, the major existential question was ‘Where do these birds come from ?’ It may thus seem inevitable that a whole cult would spring up around such birds that came from nowhere. The winner was treated as a God all year, lived in a cave, and mated with a virgin. The ceremony persisted until the 1860s, and is the best-studied and known aspect of Easter Island folklore. Kevin Costner’s Rapa Nui film is not accurate in the way it portrays the competition as a race. The islanders actually spent several days on the islands, waiting for the birds to arrive. 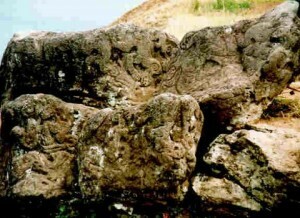 Petroglyphs by the Orongo crater. There are petroglyphs aplenty in Orongo. Note in the picture on the left, the birdman upside down (diving ?) at the top. This motif appears everywhere. Eric von Daeniken thought he was an actual being from outer space. That night I ate at Gil’s. Gil was from Marseille and I got the impression he was fleeing from problems at home – he described to me Easter Island as an “open prison”. He’d married a Chilean and adopted her name “to be lost and forgotten”. I asked for the house wine and some unpronounceable ocean fish and he brought me some God awful stuff. When I complained, he shrugged me off with a glacial Gallic putdown: “This, I only use for my soup”. Still, he saw I wouldn’t be fobbed off with cooking wine and brought me some Undurraga Rhin. I had risen in his estimation. Unlike the Argentinean couple next to me who asked for their beef rare. When it came almost raw they complained, so Gil retorted majestically: “but in France, madam, this is what we call rare!” That shut them up and they obligingly started chewing the sinews. At least Gil had an espresso machine. Bliss, as the Chileans only offer you some Nescafe and hot water. Or part bliss since he had no milk. There is no fresh milk on the island. After dinner Gil took me and Beatrice to the disco, but only after his house guard arrived. “Guard ? Is there crime on Easter Island ?” I asked. “Only where booze is concerned”, he replied . “He is here to protect my wine bottles”. One disco that really looked at felt rough had pool tables where the locals were playing pool very badly. It was obvious they mimed what they saw on TV and no one had taught them how to play properly. Guess how Gil makes his money. By beating the locals at pool.